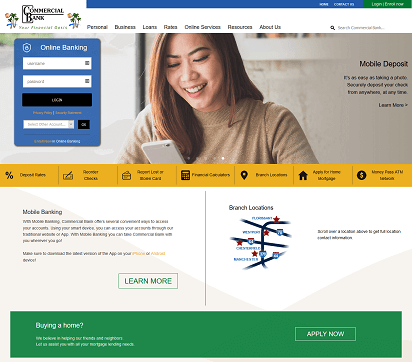 Commercial Bank wanted a new website design that was responsive and gave the site a fresh more modern look while allowing their clients to have mobile access. Unidev’s web design and development team created a visually appealing responsive website in the WordPress content management system. The CMS allows the client to easily control and update their content quickly as needed. Before the redesign project, the client had two websites to maintain: a .mobi site for their mobile customers and a .com site for their desktop users. The redesign project eliminated the need for two websites. The responsive design allows the client the benefit of having just one site which gives users access to the site on any device connected to the internet. Want to learn more about how Unidev can assist your organization with WordPress or a responsive website design? Please use the form to contact us today!